Living area, joining dining & kitchen, open space concept. Kitchen with all your cooking amenities.Kitchen, Living and Dining area, all open space concept. Shower and Tub. Full Bath, 2 sink vanity, Shower and Tub. Living and Dining area, all open space concept. 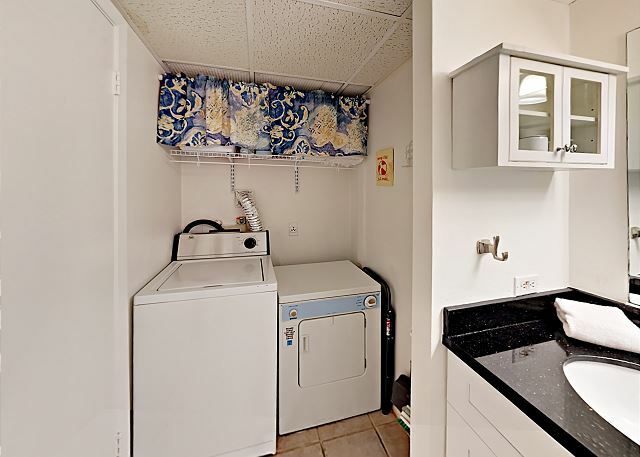 Kitchen with all your cooking amenities Washer & Dryer Community Shared Pool, Lawn Chairs, BBQ Pits, Picnic Tables all along Condominium Grounds. Showers right outside condo to shower off sand when you get back from beach. Community Shared Pool, Lawn Chairs, BBQ Pits, Picnic Tables all along Condominium Grounds. Showers right outside condo to shower off sand when you get back from beach. 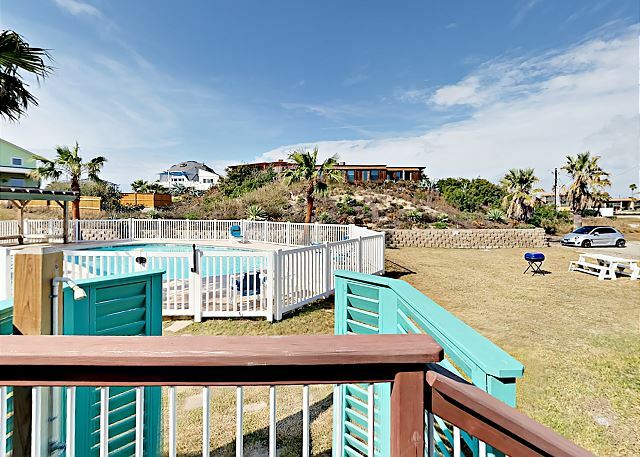 Community Shared Pool, Lawn Chairs, BBQ Pits, Picnic Tables all along Condominium Grounds. Showers right outside condo to shower off sand when you get back from beach. Community Shared Pool, Lawn Chairs, BBQ Pits, Picnic Tables all along Condominium Grounds. Community Shared Pool, Lawn Chairs, BBQ Pits, Picnic Tables all along Condominium Grounds. Community Shared Pool, Lawn Chairs, BBQ Pits, Picnic Tables all along Condominium Grounds. Community Shared Pool, Lawn Chairs, BBQ Pits, Picnic Tables all along Condominium Grounds. Community Shared Pool, Lawn Chairs, BBQ Pits, Picnic Tables all along Condominium Grounds. 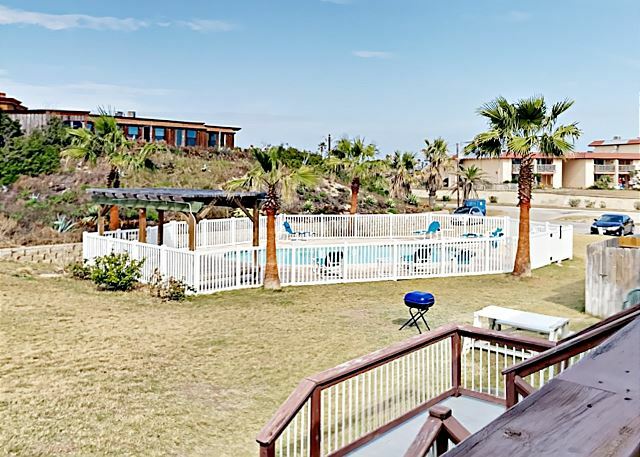 Community Shared Pool, Lawn Chairs, BBQ Pits, Picnic Tables all along Condominium Grounds. Community Shared Pool, Lawn Chairs, BBQ Pits, Picnic Tables all along Condominium Grounds. Showers right outside condo to shower off sand when you get back from beach. Community Shared Pool, Lawn Chairs, BBQ Pits, Picnic Tables all along Condominium Grounds. Showers right outside condo to shower off sand when you get back from beach. Community Shared Pool, Lawn Chairs, BBQ Pits, Picnic Tables all along Condominium Grounds. Showers right outside condo to shower off sand when you get back from beach. 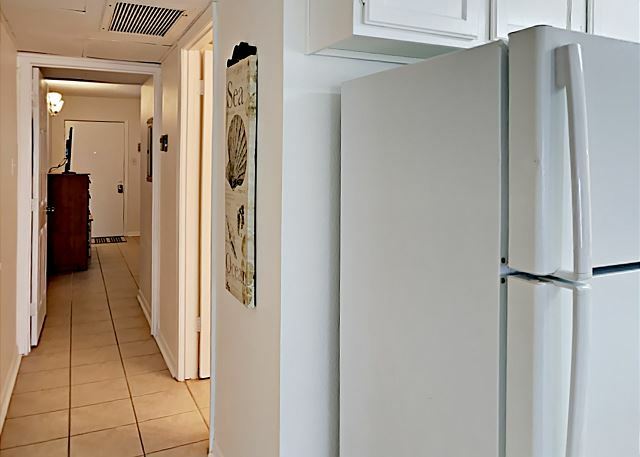 Community Shared Pool, Lawn Chairs, BBQ Pits, Picnic Tables all along Condominium Grounds. Showers right outside condo to shower off sand when you get back from beach. Community Shared Pool, Lawn Chairs, BBQ Pits, Picnic Tables all along Condominium Grounds. Showers right outside condo to shower off sand when you get back from beach. Living area, TV, With Sofa Sleeper, Dining area, and Kitchen all open space concept. Television with a DVD player. Living room with a DVD player. Kitchen with all your cooking amenities.Kitchen, Living and Dining area, all open space concept. Kitchen with all your cooking amenities Kitchen with all your cooking amenities.Kitchen, Living and Dining area, all open space concept. Full Bath, 2 sink vanity, Shower and Tub. Nice Spacious 1 bedroom unit on 2nd floor in Seamist Condos by the shared pool, short 5-minute walk to the beach over the boardwalk in the Banyan beach subdivision. This unit is fully furnished, this would be a great escape to paradise for you and your family. The shared pool has a great common area around it with charcoal BBQ grills and picnic tables. Guests have assigned parking spots, parking for 2 cars. 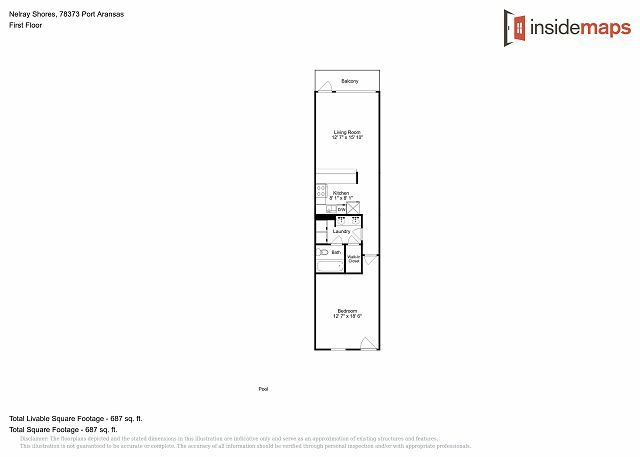 This floor plan is laid out to very to accommodate at least 4 guests, fully equipped with appliances, dishes, linens, full-size washer/dryer in unit. Sit out sipping a glass of wine on the patio while watching the sunset, catching a glimpse of the ocean view . No boats or trailers. Thank you for your review. We hope to have you stay with us again. Thank you for choosing to stay with us. We are happy to hear that you had a great stay. We would love to have you again. Thank you for the review. Every thing was up to my expectations. We brought our three kiddos to this adorable apartment for one last summer visit. It was the perfect size for 5. It was very tidy, provided extra beach toys and very cozy. The stroll the beach was great. We loved the location and could still hear the waves and feel the breeze on the balcony in the evenings. We loved it. Thank you so much for visiting with us, please come again soon! 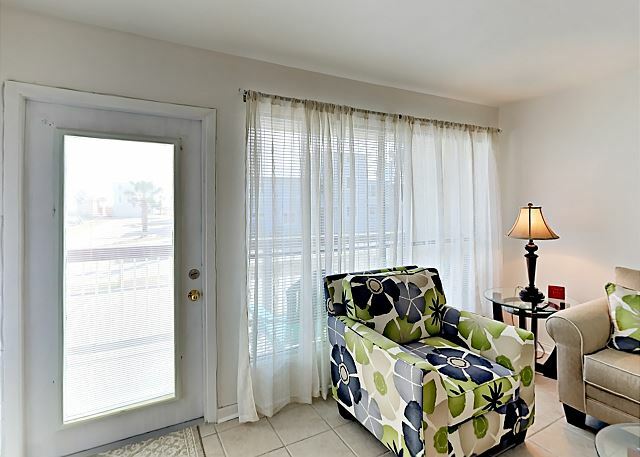 Nice floor plan, great big screen TV in living room, comfortable living area furniture,good access to beach. No side panel on dishwasher - exposed insulation, etc. Bath area needs big time makeover. Coffee maker barely adequate. Beds uncomfortable. 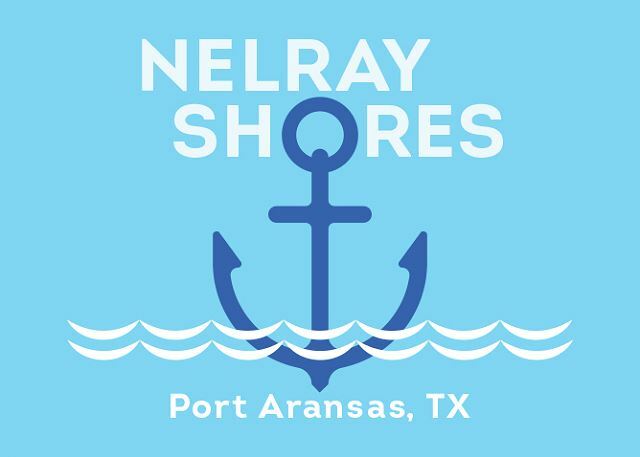 But, OK overall, Port A is the big attraction. Thank you for your review. We will contact the owner and address your concerns and issues. We would love to have you back in the future.